I’ve noticed a flood of great mecha creations being posted lately, and I’d like to call attention to a few of them. 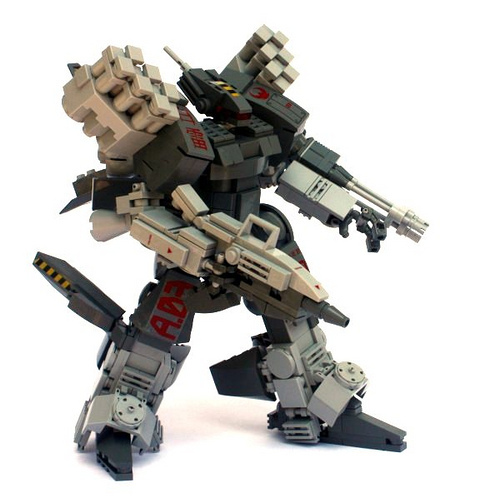 Kyle Vrieze (bermudafreze)has really out-done himself with his latest mecha, the AC01 above. He’s done some great things with armor, especially around the ankles, and I also quite enjoy the head. He has also made great use of stickers throughout. This thing is just armed to the teeth. It has missile pods on each shoulder, and a huge built-on gun on the left arm, but that doesn’t stop it from picking up a rifle with the right hand. Flickr’s Crimson Wolf has been featured here often, but I’m not going to let that stop me. This mecha has an old-school Battletech feel, with its big body, bulging weapons and chicken legs. It also has all sorts of new-school building techniques and details to set it apart. 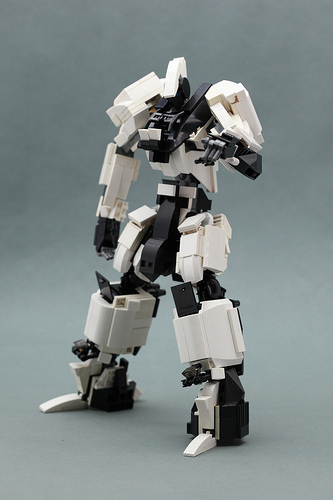 I’m especially keen on the feet, and I love any mecha with external pistons at the joints. 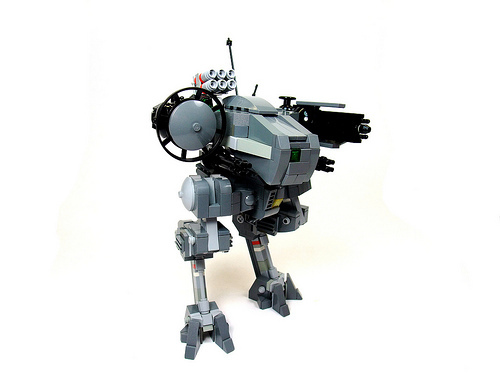 Hunabkru has built an excellent mecha of his own, the MX-6 “Berserker” Close Combat Mecha. I really love the use of car doors for an extra bit of armor plating for the knee. The head is also quite nice. The proportions and style of the bot remind me of the very old game One Must Fall 2098. The mecha also has a pretty rockin sword, if you ask me. These mechs are quite good. I like them. Yes they are. I really appreciate the detail and craftman-ship of the AC01. Beautifully done. I am not a Mech builder myself, but truely appreciate a well built Mech!